All Magento news and updates for Magento 2 extensions, themes – both premium and free. 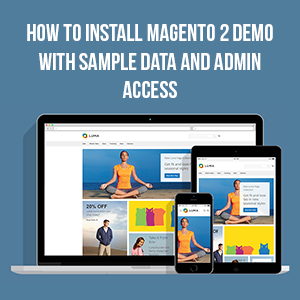 Following our last blog on how to install Magento 2 developer version, today we would like to show you how to install Magento 2 demo with sample data and admin access. 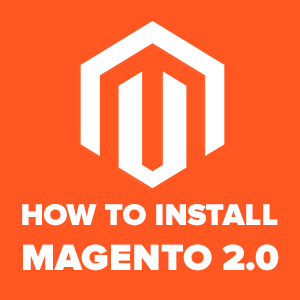 Our demo site for Magento 2 is ready for testing. You can access with the following details and please note that the site will be reset after every 12 hour. Updated on June 24, 2016: As can be seen on our Github, this Crafts version based on Magento alpha 1.0.7, yet we hardly find chance to keep ongoing updates to this free version because there have been huge changes in Magento 2 since then and our internal plan as well. Check out the new Crafts for Magento 2, with some important changes -- here. Magento 2.0 has been the talk of the Magento town for months and the beta version was finally released yesterday. Not staying behind we are today releasing our first FREE responsive Magento 2.0 theme (beta) for you all to test drive. Our team has been tracking the progress and working hard to stay updated and prepare ourselves for the official Magento 2.0 release. 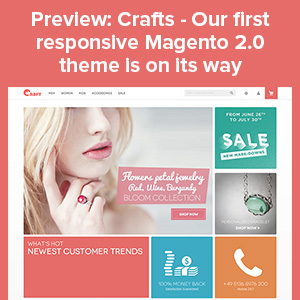 Preview screenshots of our free Magento 2.0 theme -- Crafts. Having an eCommerce Magento site and longing for more graphics, messages or charts? Wondering if you can do it manually? Sure! 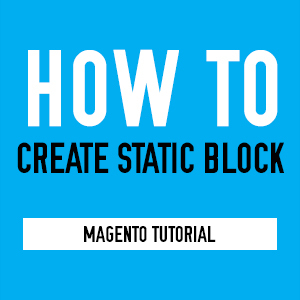 You can get it done with ease by creating a static block of your desired content and call it onto your front-end. Let me show you how.